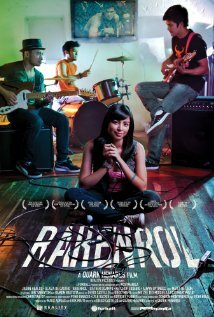 "Rakenrol" in essence is a very messy film. It is a confusing smorgasbord of random scenes, characters and plot lines that contribute little or nothing to the movie. Actually, come to think of it, the movie has no clear direction on what it wants to do or where it wants to lead the audience. It's not as straightforward as what we are used to seeing - even for indie films we have seen from the past. Bottomline, "Rakenrol" is a huge disappointment. It is a film that looks and feels like it has a serious case of ADHD and not even the cameos by the greats of Pinoy rock can salvage this film from utter doom. Odie (Jason Abalos) and his best friend Irene (Glaiza de Castro) are outcasts in their school. While most of their peers like mainstream pop music, both of them are obsessed with local underground rock music. One day, both decide to make a band of their own. They meet Mo (Ketchup Eusebio), the vocalist of a now defunct band and Junfour (Alwyn Uytingco), a pent-up bully with rage issues. With their line-up complete, their band Hapipaks faces countless struggles and misadventures as they try to make a mark on the local music scene. It's not actually all bad for "Rakenrol". It does have its moments. We actually liked the short skits on rock genres and the flashback sequences that used pen-like graphics as visual aids. They do give the film a character of its own but these creative sequences are in fact few and far between. The main story was surprisingly good. It had potential especially how life and music mimic each other hand-by-hand but it all gets ruined with scenes and characters that we wished were scrapped from the get-go. Do we really need the scene with Flame Tigerblden or Jonathan or the characters of Yagit and Matet de Leon? Do they really add up anything to the story or to the movie's impact? If they had importance then it was not clear-cut (this is more so for Yagit). And if they were added just for cheap laughs then for shame. The film also lacks the mindset of actually developing the conflicts it presents. For example, Irene was kissed by the rockstar Jacci Rocha. She was seriously offended to the point she went down his car and went home on her own. Next thing you know, they are already in a relationship. Another example is Junfour who impregnates his girlfriend. He ignores her in a a handful of scenes. Next thing you know, everything is okay and Junfour is a dad. It's minute details that "Rakenrol" fails to work on and yet makes an effort on snipping in distracting scenes. Finally, we also think the film was overtly miscast. Outside Ketchup Eusebio and Alwyn Uytingco, everyone seems out of place. Jason Abalos seems awkward performing as Odie while Glaiza de Castro was just plain average and they certainly lack chemistry as a couple. The worst off was Diether Ocampo. He was obviously cast because of his looks and body not his oratory talents. "Rakenrol" has potential. Inside all the clutter is a wonderful story with lessons abound. All wwe can say is "sayang" (what a waste).